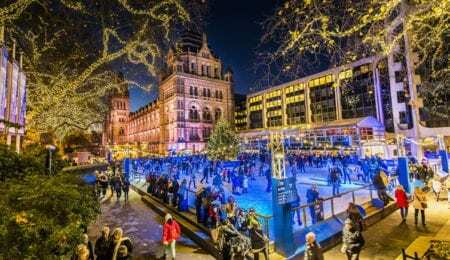 Where to skate this Christmas? ’Tis the season, and one of our favourite winter activities is now in full swing. The originally snowy sport from more than 3000 years ago of ice skating, which originated in Finland, is growing increasingly popular each year at Christmas time, and the number of ice rinks popping up all over the capital reflects that. With Christmas trees and spectacular lights creating magical backdrops, you do not want to skip the rinks this year. A trip just for the views alone is a must. London’s ice rinks do get very busy and booking in advance is recommended, so you’d better be quick and get your skates on (ho ho ho) if you don’t want to miss out! 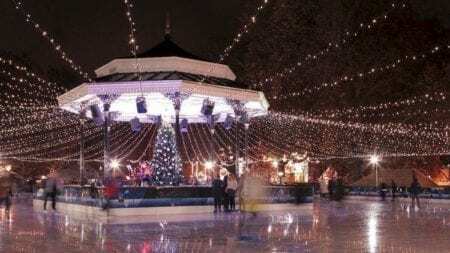 Winter Wonderland’s ice rink is the biggest outdoor rink in the UK. It surrounds the Victorian bandstand and is illuminated with more than 100,000 lights. – Each ice skating session will last 50 minutes. – Arrive 20 minutes before your booked session. – All children of 12 years and under will need a ticket and must be accompanied by a person of 16 or over. – There is no charge for skate hire, though you may bring your own skates. – A cloakroom is available – £1 per item. – We have a professional photographer who can take a souvenir photo for you. – Ice rink spectator areas are free to access. 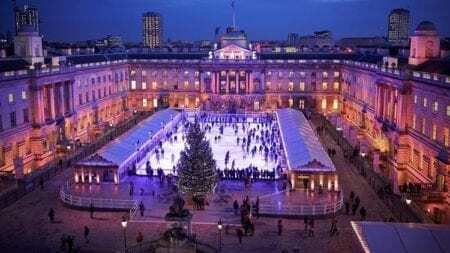 Skate in the stunning Somerset House courtyard during the day, then after dark the rink hosts some of the best international clubs and festivals at exclusive Club Nights. This season, for the first time, Somerset House have partnered with EFG London to present a special one-off Jazz Skate. Afterwards, treat yourself to a cocktail, indulgent Welsh Rarebit or hot chocolate from the Skate Lounge or Fortnum’s Lodge. Skate Extras include Champagne & Chocolate Truffles, Wine & Fondue for Two, or Champagne & Smoked Salmon Blini, all served in Fortnum’s Lodge on-site. There is a Skate School and Polar Cub Club for young children. The West Wing will be transformed into The Christmas Arcade, a pop-up version of the classic Fortnum & Mason Piccadilly store, open daily until 3rd January. Get festive at Tuesday Treats when skaters and spectators can enjoy seasonal food, drink and music plus late-night shopping experiences in the arcade. Session times vary between 8:45am and 11:30pm. See website for details. From £7.50. See website for details. 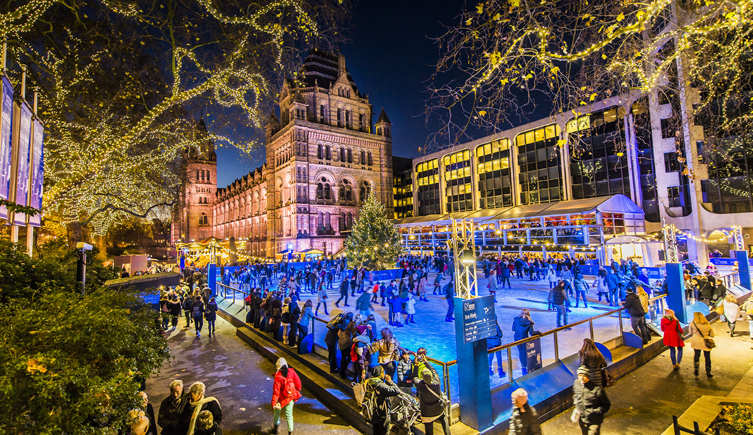 This year skate with the beautiful backdrop of Alfred Waterhouse’s Natural History Museum buildings, fairy-lit trees and a majestic Christmas tree in the middle of the rink. The main area is 1,000 metres square, joining a smaller rink for children. 2015 celebrates its eleventh year, and will provide the usual festive fun: a Café Bar overlooking the ice with live music on Thursdays and a fairground carousel. See the website for wheelchair-user sessions, and note that the rink is occasionally closed for private functions. It is also closed on Christmas Day. Session/opening times vary between 9:00am and 11:00pm. See website for details. 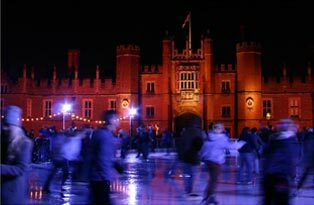 Take to the ice in glorious Tudor surroundings in front of King Henry VIII’s magnificent palace, on the banks of the river Thames. In the evening see the stunning palace lit up after dark while you skate under the evening stars. This year, Hampton Court Palace is 500 years old, and you can also explore the regal apartments. There is an Ice Bar & Café for your post-skate warm up, serving a selection of winter drinks and festive snacks. Session times and peak hours vary. See website for details. From Monday 21st December to Sunday 3rd January all sessions will be charged at peak rate. With its 200 metre square rink, JW3 brings ice skating back this holiday season for the third year running. Don’t miss “Chanuka on Ice” on December 12th, if you’re looking for a slightly different experience! There will be a Silent Disco on ice with two of London’s finest DJs. There is also the Zest Cafe to warm up in, open to both skaters and non-skaters. Session times vary. See website for details. If indoors is more your thing, head over to Westfield and join the 160 capacity rink. Have fun with family entertainment, themed sessions, live performances and DJs. Sessions last 45 minutes, with 30 minutes on the ice. There are “Bumper Sessions” available at off peak times for those who require a longer ice fix! Minimum skating age is 4 years old. Children aged 4-7 must be accompanied on the ice by adult. Maximum of 5 children per adult. 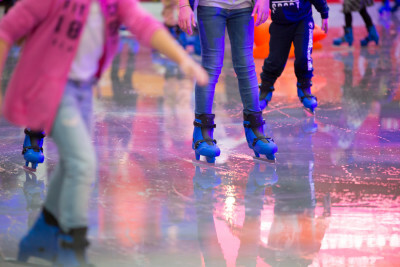 Children aged 8-12 are allowed to skate on their own as long as a parent or guardian is observing them from the viewing areas while they skate. Wheelchair skaters are most welcome and must be accompanied by an adult assistant skater. Maximum of 5 wheelchair users on the ice at one time. Please mention when booking. Session and peak/off peak times vary. See website for details. 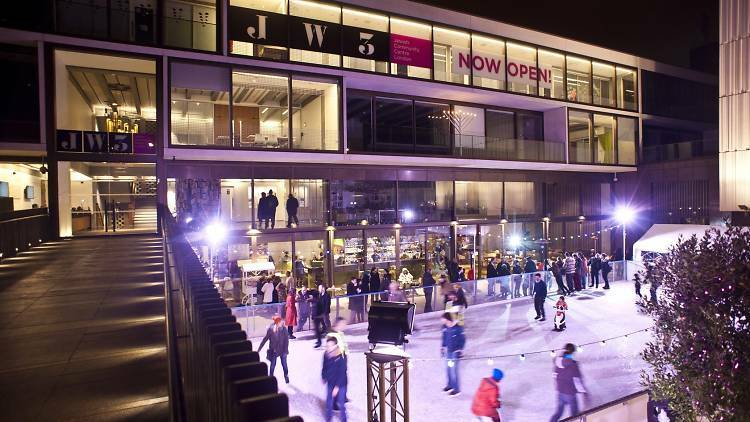 JW3 – Blake Ezra Photography Ltd.
Somerset House – Life After Print Ltd.